At Halloween, he decorated the museum with dozens of candle glowing jack o' lanterns under black and orange streamers. He'd tend the door himself in high lace up boots, orange rhinestone hot pants, a tight black t-shirt, and black boa with orange swirl. You could eat the cupcakes, no poison, chocolate with orange frosting. “Take two, sweetie,” he'd instruct, poking the sterling tray at you. My Auntie and I lived in his neighborhood, East Tropicana, and the museum was just around the corner. A Cowboy Jim's Video Poker, The Alameda Smoke Shop, and Terrible's Chevron Car Wash also occupied Liberace Plaza. Spilled soda, motor oil, and chewing gum stained the Plaza's asphalt. Inside, a rhinestone encrusted Rolls Royce sparkled, and you could touch and play a baby grand that Lee himself had used in “the famous Riviera performances.” Who's Who photos lined the walls; Lee with Richard Nixon, with Miss Patti Page, with William Kunstler, with Al Kaline, and Fidel Castro. Yup, Fidel. And one photo pictured Wladziu Valentino in purple sash with gold letters reading, Mr. Showman, Las Vegas! You captured with artful wit the innocence meeting the artful. Surreal. Thanks Kitty, Gary, Sam (as always) Jerry, and Matt. "Inside, a rhinestone encrusted Rolls Royce sparkled"
Wonderful pictures and details, Steve. 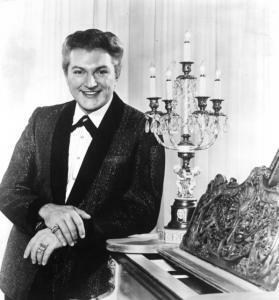 My sainted grandmother loved Liberace. But then, she loved Gorgeous George, the wrestler, more.